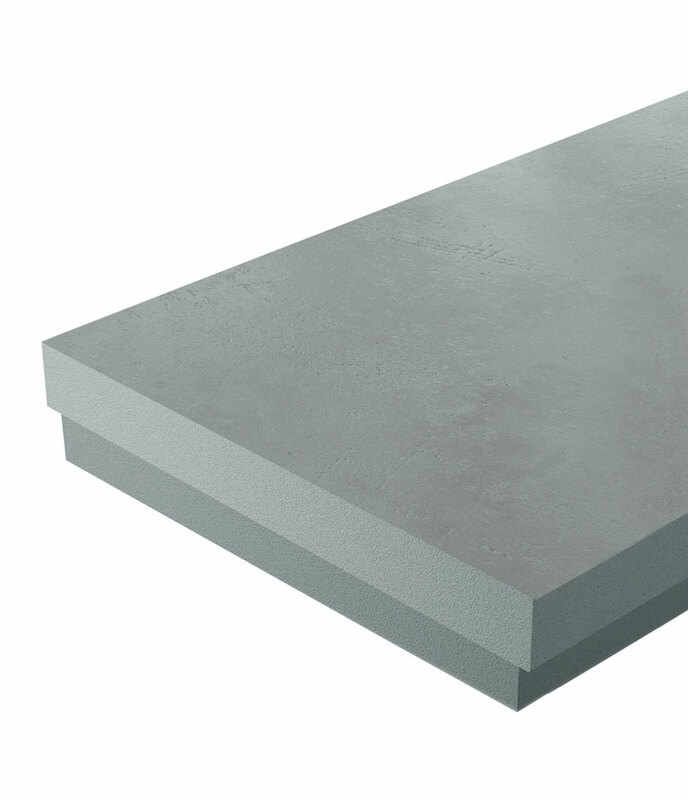 ProTherm G XENERGY SL-EP Inverted Roof Insulation is a unique rigid, closed cell type Extruded polystyrene board with integral high density skin. ProTherm G inverted roof insulation utilises infra-red blocking particles to scatter and reflect heat radiation. ProTherm G XENERGY SL-EP Inverted Roof Insulation has a Zero Ozone Depletion Potential (ODP), a Global Warming Potential (GWP) of less than 5 and a Green Guide to Specification A+ rating. 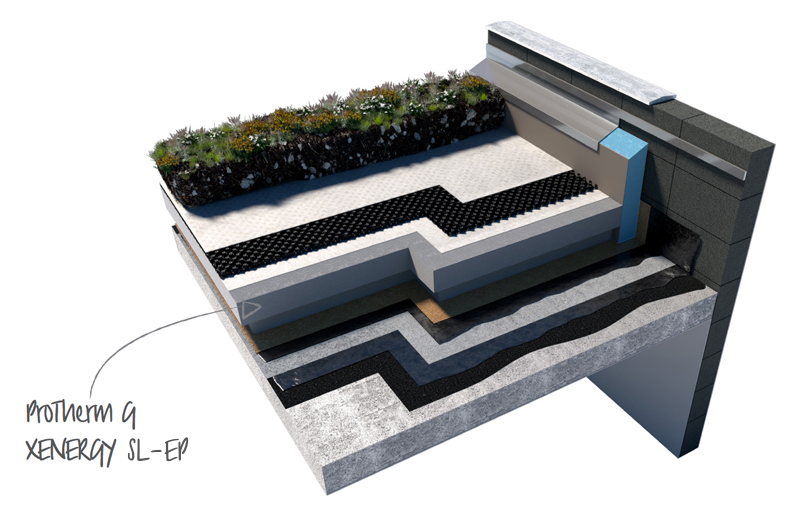 For use with Inverted Roof Waterproofing such as PermaQuik PQ6100, EshaFlex, EshaUniversal and ParaFlex. Use with ProTherm Xenergy MinK Water Flow Reducing Layer prior to the installation of paving, ballast, a green roof or timber decking. For a comprehensive NBS J31 specification contact Radmat Building Products. Apply ProTherm G XENERGY SL-EP Inverted Roof Insulation parallel to roof perimeter long edges. Stagger end joints. LayProTherm G XENERGY SL-EP Inverted Roof Insulation with edges in moderate contact without forcing. Cut ProTherm G XENERGY SL-EP Inverted Roof Insulation to fit neatly to perimeter blocking and around penetrations through roof, when using a 2nd layer stagger joints of insulation from first layer. Apply no moreProTherm G XENERGY SL-EP Inverted Roof Insulation than can be covered with aggregate ballast/concrete roof pavers/green roofing in the same day. Keep ProTherm G XENERGY SL-EP Inverted Roof Insulation to a minimum 75mm from heat emitting devices, and minimum 50mm from sidewalls of chimneys and vents. Before applying the chosen roof finish install ProTherm G XENERGY MinK Water Flow Reducing Layer over the ProTherm G XENERGY SL-EP Inverted Roof Insulation ensuring Radmat standard details are adhered to and all overlaps are 300mm wide. ProTherm G XENERGY SL-EP Inverted Roof Insulation contains PolyFR, a REACH compliant flame retardant, that ensures Euroclass E performance to EN13501-1. Hexabromocyclododecane (HBCD) was phased out prior to the 21st August 2015.